Anyone can post an article about Thanksgiving the week of; what would happen if you got another chance to think about gratitude, thanksgiving and spirituality the week after? To find out, read this guest post by Professional Writing senior Will Overton on the theme of thanksgiving throughout the sermons of Rev. Selsus E. Tull. Thanksgiving has been observed in the United States ever since the Pilgrims celebrated their first successful harvest in 1621. However, it was not until Abraham Lincoln was president that it became an officially recognized national holiday. While we are familiar with the usual staples of the holiday, dinner with our families, the Macy’s parade, etc., we are also thankful for what God has provided for us. In a series of sermons, Selsus E. Tull delivers his thoughts on the importance of Thanksgiving and how we should not relegate giving thanks to just one day a year. Selsus E. Tull was a prolific pastor in the Southern United States in the first half of the twentieth century. Tull preached on many topics over the course of his long and illustrious career, including the importance of giving thanks in our lives. 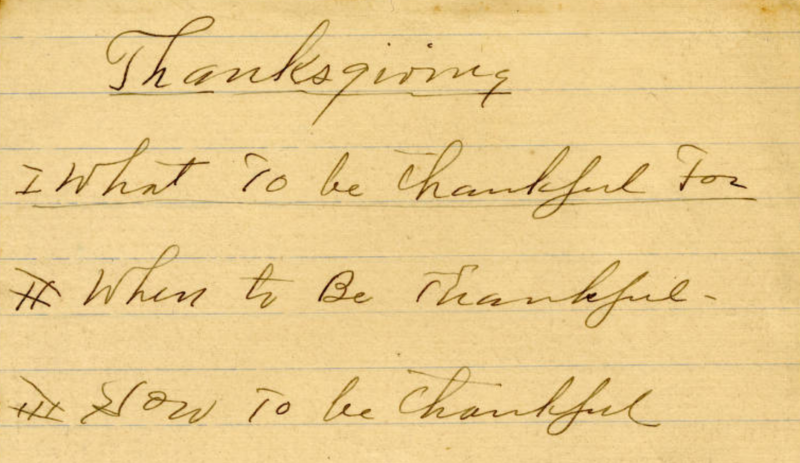 While complete transcripts of Tull’s Thanksgiving sermons do not exist, we are offered a glimpse into his thoughts on the holiday. Even with pieces missing, these sermons are as meaningful today as they were when he first delivered them. In his sermon titled “Thanksgiving 1926: A Contrast in Life’s Ideals”, Tull uses Luke 12:16-23 and Psalm 116 as a way to draw a contrast between two men who lived different lifestyles. The man in the Luke verse stores up treasures on Earth after he “yielded an abundant harvest” (Luke 16:16). While he plans to store the grain in his barns for his own use, God warns him that he will die before he can use it. Jesus summarizes the parable by saying “For life is more than food, and the body more than clothes” (Luke 16:23). Tull is using this advice to warn his congregation to show thanks to God and store up treasures in heaven instead of earth. If they devote their lives to God and do not store up treasures for themselves on Earth then they will live a rich and fulfilling life. Psalm 116 is a psalm of thanksgiving often attributed to David. Despite the hardships in his life, he continues to praise the Lord. In contrast to the man in Luke 16, the speaker in Psalm 116 is devoted to the Lord and gives what is owed to him. This is shown in verse 12 where he asks “what shall I return to the Lord for all his goodness to me?” (Psalm 116). The tone of the Psalm is also more reverential than the parable of the man and his grain. The use of these two verses is meant to draw a comparison between the man who “looked at the harvest” and the man who looked “at the Lord of the harvest.” Tull hopes that the congregation behaves more like the man in Psalm 116 in their daily lives and not just at Thanksgiving. The Tull sermon titled “Thanksgiving” gives its message rather succinctly. Tull wants his audience to know “what to be thankful for”, “when to be thankful” and “how to be thankful.” Those three phrases make up the entirety of this sermon note. While no other information is available about the sermon Tull delivered, his talking points make it clear what he wanted his audience to take away from it. In “Thanksgiving Service”, Tull talks about the third chapter of Colossians and what Thanksgiving means to Christians. One of the ways that Tull talks about Thanksgiving is by saying it is an obligation that comes out of a blessing. Whenever we feel blessed by something God does for us, we are obliged to give thanks for it. The concept of giving thanks and celebrating Thanksgiving is called “a unique and most commendable custom.” One of the harsher truths Tull brings up is the quality of someone who does not give thanks when they receive a blessing. According to him, ungrateful people are “a blight and a curse” on the world around them. But none of those people are at the service on the day Tull spoke because he feels assured that he is addressing “Christian hearts” who know how to “give thanks.” This set of sermon notes ends with the beginning of a list that is now incomplete. Whether Tull wrote more or the remainder are lost is unknown. There is no incorporation of verses from Colossians 3, indicating that either the chapter was recited at the start of the sermon or that it was part of the sermon not included in Tull’s notes. There is another Tull sermon titled “Thanksgiving Service” that finds Tull speaking about Thanksgiving as a “distinctly…American day.” Tull’s assuring his congregation that everything wrong with the world today, 1937 to be precise, is due to the actions of man not God. These words of assurance are true, even if there are some people who would argue against it. Tull delivering this sermon during the Great Depression is his way of reminding the congregation that they should still give thanks, even if they do not have an abundance of earthly goods. The idea that we should give thanks during hard times is especially important today, when it seems like there are more hard times than good. Tull’s words reiterate the notion that giving thanks is not just for when everything is going well in our lives. We should give thanks even when times are rough, if for no other reason to remember what good we do have in our lives. In his “Thanksgiving 1927” sermon, Tull delivers a memorable quote: “We ought not to live in the past, but the future of no people is safe who forget the past.” Thanksgiving is meant to be a day of remembrance, which is reflected in this sermon. Tull talks about people’s reliance on the Psalms when the Psalms are only concerned with the relationship between God and his people. These sermon notes are interesting because they include both long hand and short hand writing. Tull knew the major points he wanted to touch on, but also jotted down brief examples of giving thanks to help illustrate them. The “Contentment” sermon has Tull preaching on the subject of finding Contentment in giving thanks. This sermon is important to Tull and his congregation because it was delivered during the Great Depression, though it is never brought up in the sermon. Instead, he talks about people clamoring for material needs, even when they cannot afford them. Tull makes a lot of strong points in this sermon, particularly about people needing most what the world cannot provide: “peace of mind and contentment of soul.” Tull’s sermon about finding Contentment at Thanksgiving, especially during a time as trying as the Great Depression, is certainly fitting and still applicable today. 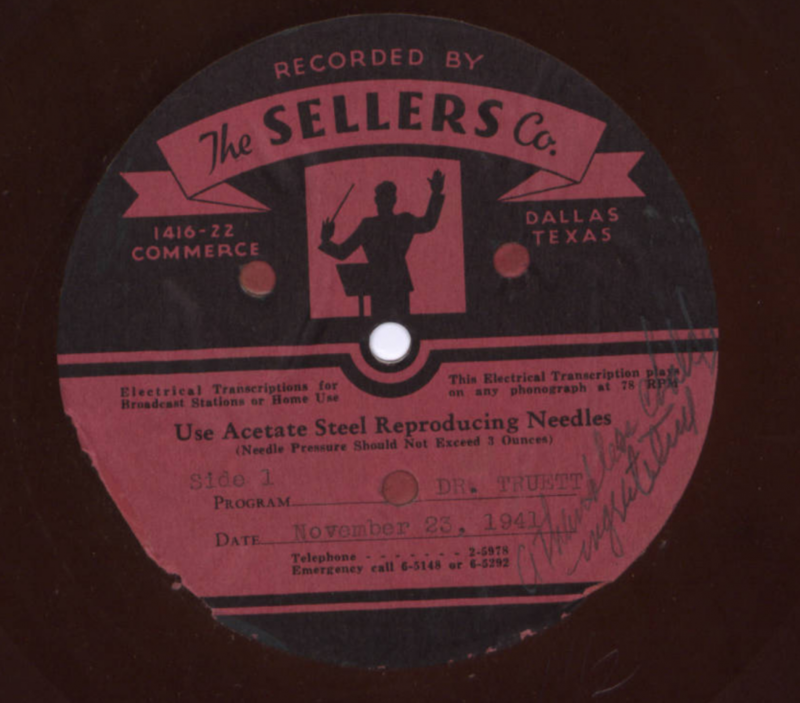 “Thanksgiving in the year 1942” follows a similar pattern to Tull’s previous sermons. He talks about the meaning of Thanksgiving and relates it to how we should be thankful for what we have. One difference with this sermon is Tull’s opening “sketch of the First Thanksgiving Day.” Among the Tull sermon notes collected in the archives, this is the first to directly mention the Pilgrims. Tull draws upon the story of the Pilgrims and the First Thanksgiving as a way of reminding his congregation that the principles and beliefs that America were founded on are tied to the holiday of Thanksgiving. At the time this sermon was delivered, America was in the midst of fighting in World War Two. Tull directly mentions the war on page five of his notes as a way to tie the current conflict with the American fight for Independence. Men were fighting to protect everything America stood for in the 1940s, just as they did in the American Revolution. In fact, soldiers fighting for “the survival of our American Liberties” is one of the things Tull mentions that his congregation should be thankful for. Besides the obvious tie-in to Thanksgiving, this is a sermon that would only have been heard during wartime. Specifically, the parts about being thankful for men who are fighting to protect the principles of freedom that America was founded on. That’s not to downplay the sermon’s importance in any way, just to point out the type of sermon that major world events like World War Two gave us. Tull’s other sermon notes are not directly about Thanksgiving, but do mention it as a means of talking about the topic of the sermon. Comparing Tull’s Thanksgiving sermons to the Thanksgiving sermons of George W. Truett reveals a few similar ideas and themes. Both Truett and Tull talk about gratitude and being thankful. Truett even starts his sermon titled “Ingratitude: The Commonest Sin” by talking about the Pilgrims and the First Thanksgiving. Both pastors share the belief that people should be thankful every day of the year and not just on Thanksgiving. Truett goes on to say that no matter how much we thank God for everything he provides for us, we will never be able to “sufficiently” thank him. The idea that ingratitude and thanklessness is the most common sin amongst humans is interesting because of the implications. Ingratitude is the most common sin because we sometimes forget to appreciate what others do for us and what we have. Some may argue against his claim, but ingratitude can still be seen around the world. Where Tull discusses the act of giving thanks in relation to world events like the Great Depression, World War Two and the significance of the First Thanksgiving, Truett uses real-life stories as examples. Even though Tull and Truett approach the topic of giving thanks from similar points of view, the use of real-life examples in their sermons differs. Because of the way Tull wrote his sermon notes, it is sometimes difficult to see where he made use of the included Bible verses. But they should not be dismissed because of their brevity. 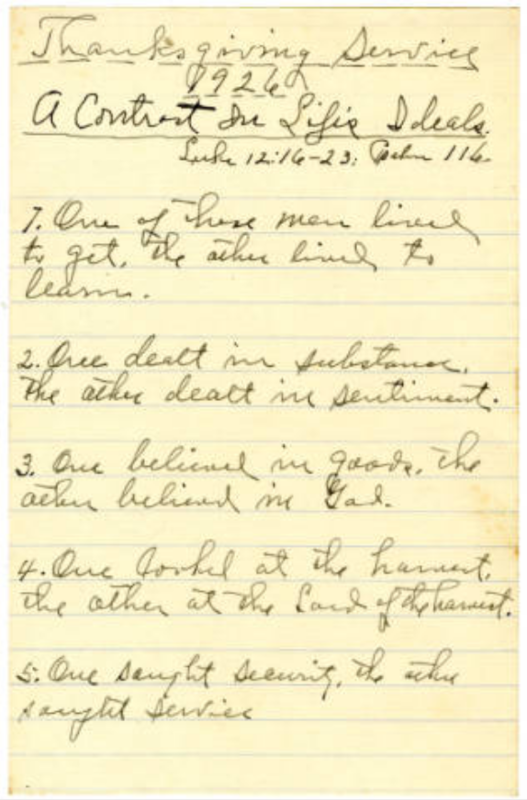 We can learn a lot about Tull’s beliefs from his sermon notes and be thankful for what notes of his we do have in the digital collections.